5 Star Aladdin is ready for adventure with Abu and his magic lamp by his side. 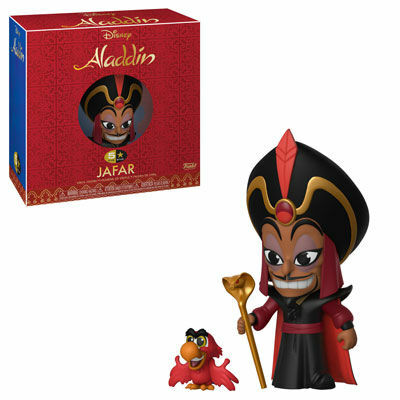 5 Star Jafar has his loud-mouthed parrot Iago and magic scepter. 5 Star Genie and his magic carpet are ready to grant you three wishes and maybe take you on a tour of Agrabah. 5 Star Jasmine has her loyal tiger Rajah at her side. Legal Notice: Entire contents trademarked (® or TM) and copyrighted (©) 1986-2019 by Things From Another World, Inc. and respective copyright and trademark holders. All rights reserved. Page rendered at 2019-04-19 12:10:30 in 0.262 seconds.